If you are a lover of miso soup, you have most likely heard of dashi, an umami-blasted cooking stock made of seaweed (specifically kombu) and fermented tuna. If you want to make your own super savoury elixir, but don't have any tuna lying around, you can make a smoky spin-off using bacon. Click the link below for the full recipe and instructions, but you don't have to be an Iron Chef to pull this off. Simply snag 50g of kombu (which you can find at your local health food store, Asian grocery store or online) and steep it in two quarts 140-degree water for forty minutes. Remove kombu and add in a pound of bacon, steeping it at the same temperature for another forty minutes. (If you happen to have an immersion circulator, this would be a great use for it.) 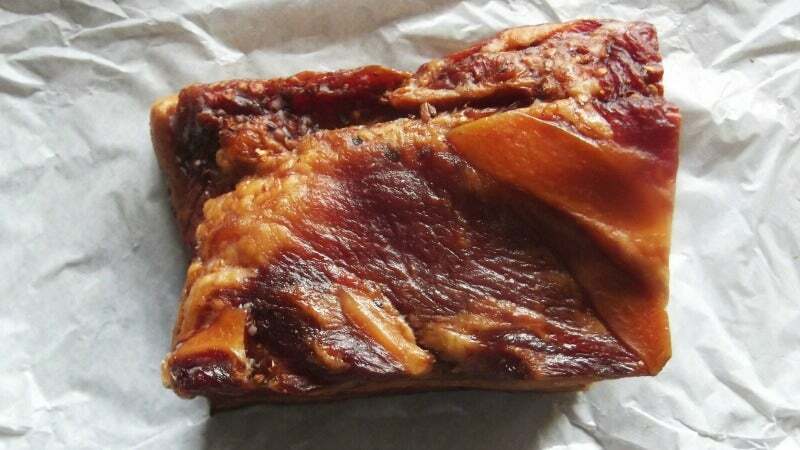 Remove the porky product and season your dashi with soy sauce, sake, mirin, or salt to taste. Use as a base for smokey soups and stews, or simply sip from a mug for tasty, warming comfort.